Super Savings Item! 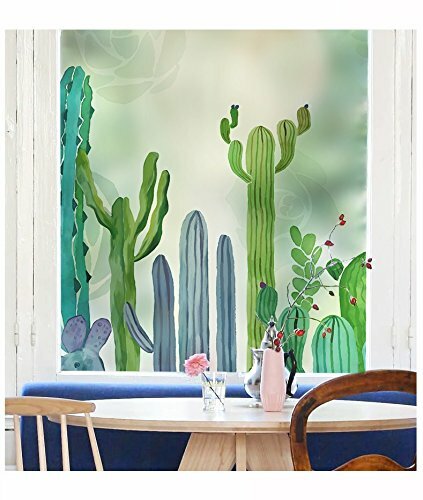 Save 32% on the YL Stained Glass Decorative Window Film, Premium Static Cling No-Glue Stained Glass Decorative Window Film, Vinyl Scrub Privacy Window Film (45X60CM, Cactus) by YINGLI at Home Decor Outlet Store. MPN: unknown. Hurry! Limited time offer. Offer valid only while supplies last. How to use: Step 1. Cut the privacy window film into the size of where you want to apply it,adding an extra 2cm to the width and height. Step 2. Step 4. Peel off the protect film and paste it onto the window. Step 5. Scrape extra water and remaining air bubbles with a scraper or card. 2.Make Sure A Cool, Smooth Surface With No Texture of Any Kind. 3.There Is A Transparent Backing Must Be Peeled off Before Installing, If Not, The Window Film Will Fall Down When The Water Dries. This decorative window film with design creating the visual effect of textured and stained glass will make your house modern and fashionable. Easy To Fix and Remove --- Can Be Removed Easily Without Any Traces Left On A Glass Or A Smooth Surface; Can Be Reused If Not Be Damaged Or Smudged. Solar control properties to reduce heat,glare and part harmful UV rays. protect the physical health;To prevent floor,curtain,carpet,furniture,art and many fabrics fade aging. Easy installation,Can be trimmed or combined to fit any size window and glass wall. If you have any questions about this product by YINGLI, contact us by completing and submitting the form below. If you are looking for a specif part number, please include it with your message.